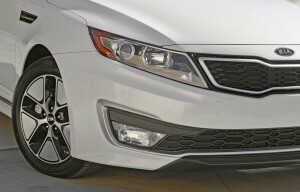 The 2011 Optima is an important product for Kia. This all-new sedan competes in a heady category against the Fords, Chevys, Hondas and Toyotas in the midsize car market. When playing against the big boys, better plan on hitting some home runs. Kia looks to cover all its bases in the all-important midsize segment with three engine offerings (gasoline, turbocharged, hybrid), three trim levels (LX, EX, SX), plus head-turning exterior styling that touches luxury territory in the interior cabin. Kia says its all-new Optima is part of an automotive design transformation for the Korean brand that is focused on displaying its spirit of dynamic confidence in the marketplace. This isn’t just talk. 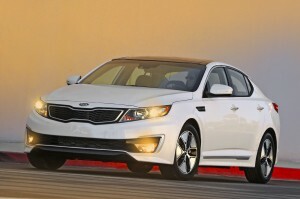 Consumers should feel confident giving their consideration to the 2011 Optima as a good choice based on recent awards. The 2011 Optima is named “Best New Model” by Kiplinger’s Personal Finance, has earned strong residual value ratings by ALG (leading provider of automotive data), and is a “Top Safety Pick” by the Insurance Institute for Highway Safety. The all-new model is longer, wider and lower than the previous Optima, resulting in a revised attitude that is simultaneously elegant and athletic. From the front-end the 2011 Optima is a real looker. The striking design is focused up front in the grille and around the swept side where the lighting assembly comes alive with a smiling flare. 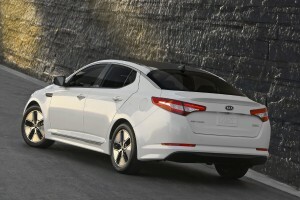 Kia enters its 2011 model into the midsize segment competitively priced at $18,995 for the base LX trim, which includes dual exhaust chrome tips, solar glass, 16-inch wheels and integrated turn signals onto the sideview mirrors. All Optima trims come standard with Bluetooth wireless connectivity with steering wheel mounted voice activation controls, plus satellite radio capabilities along with an AM/FM/CD/MP3 sound system. Our tester was the next trim level up, the EX, equipped with the optional six-speed automatic transmission with a base price of $22,495. The automatic was hooked to the standard 2.4-liter four-cylinder engine that is rated to produce 200 horsepower at 6,300 rpm and 186 lb.-ft. of torque at 4,250 rpm. In theory, a six-automatic mated to a four-cylinder with Direct Injection should do well on fuel economy, but my needle moved in a hurry like it was chewing through the gas pretty good — likely due to my hard acceleration and overall stop-and-go driving. The Optima EX tester felt a little too stiff and sporty for local driving around town, but out on the interstate, the Optima behaved much differently; it was smooth and fast. The sixth gear is a real asset on this model in highway driving. The EPA-rated figures on the automatic are 34 miles per gallon highway and 24 mpg city. Only the LX model has the six-speed manual transmission. The 2.0-liter EX Turbo might be worth taking for a spin, too. Its fuel economy is also rated 34 mpg highway and 22 mpg city for a model that generates a lot more power at 274 horsepower and 269 torque. It starts at $24,495. Manufacturer photo: The 2011 Kia Optima employs engine management systems like direct injection and turbocharging to help bring performance to the brand without sacrificing fuel efficiency. Its smooth-flowing lines speak of style, offering occupants both space and comfort with a number of standard convenience features. The sedan’s chic cabin unifies with the exterior design. TURNING CIRCLE (curb-to-curb) 35.8 ft. This entry was posted in New On Wheels, Rely on the Auto Experts -- Motor Matters Reviews. Bookmark the permalink.